The Nomad Hostel kohteessa Sevilla, Espanja: Varaa nyt! 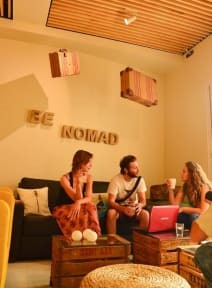 The Nomad Hostel is located in the heart of the city centre, only 600 meters walk from the Cathedral and other historic and cultural heritage sites of Seville, in a recently renovated traditional Sevillian house. Our prime central location is perfect for combining the cultural part of your holiday with the discovery of the exciting and lively local life typical of Seville and its citizens. Our staff is made up of local people and experienced backpackers, who are looking forward to giving you a warm and friendly welcome, according to our idea of the spirit of a true hostel. We know and love our city, and we want you to love it as well: we will be ready to give you tips about the most charming places to visit and we can recommend the best bars for tapas and great wine. You can also enjoy our exclusive themed tours including tapas, bike, and walking tours. You’ll need to get your energy up before all this exploring – and where better to start your day than in our beautiful courtyard with a big, healthy breakfast. If you prefer, you can prepare your meals in our fully equipped kitchen, or take in the unique atmosphere with dinner on the rooftop terrace. We offer air conditioned dorms of different sizes, all with outward facing windows for natural light, furnished with lovely locally crafted artisan bunk-beds, for the best night’s sleep you might have had in a while! If you like to socialize, you can spend time in our sitting-dining room, a cozy space with access to an outdoor courtyard, or go up to the rooftop to discover our fantastic terrace with its bar, where you can enjoy your nights chatting with fellow travelers and taking part in the great range of leisure and cultural activities including theater, live music, flamenco, movie nights, and yoga classes!